Sea Thistle Cottage in Nairn, Highlands sleeps 2 people. Sea Thistle Cottage in Nairn is a charming, traditional, semi-detached, 19th-century fisherman’s cottage for two. Situated in the heart of the historic fisher town area of Nairn, it is just a few yards from the stunning sweeping sands and delightful Victorian sea front. The cottage is located in one of the tiny winding streets that fisher town is noted for, yet it has its own parking and even a little courtyard area at the side. The cottage provides the best of modern living whilst retaining its original charm and ambience, such as solid wood flooring and thick stone walls. 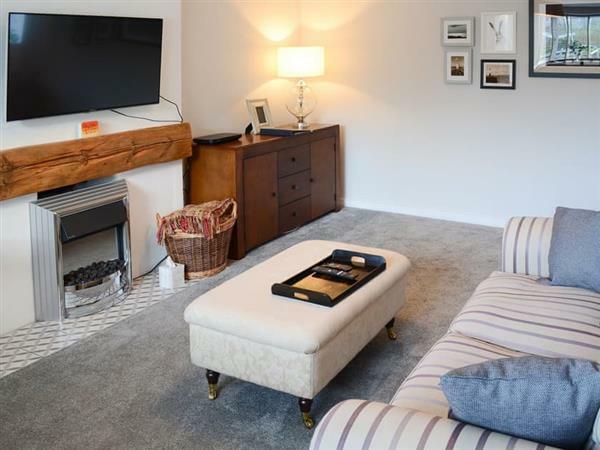 The main living area is open plan, with a large living room, with feature electric fire and wall-mounted smart TV, this L-shaped room has a dining area in the corner. There is a separate kitchen, which is compact yet bright and modern, with built-in units and is very well equipped, and a split stable door gives access to the adjoining courtyard area. There is also a handy ground floor wet room. Winding cottage stairs lead up to the fisherman’s landing. 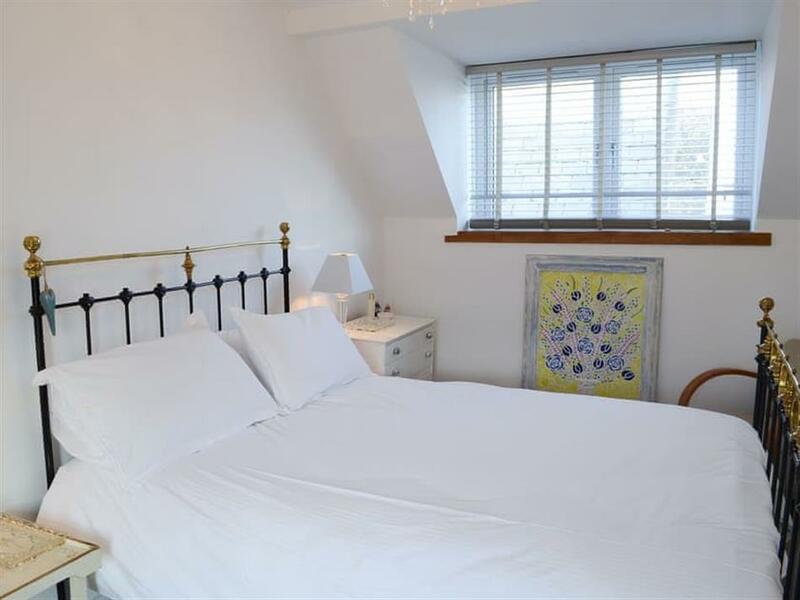 The double bedroom on the first floor has a king-size bed and a TV, it is attractively presented, with colour coordinated soft furnishings and an adjoining room acts as a dressing room, with extra space for hanging clothes and general storage. Sea Thistle Cottage is ideally located for enjoying all the facilities of Nairn, an award winning seaside town. It is also easily accessible by public transport, for those who may like to arrive by train or bus, or to forget the car whilst there and explore by local transport; a bus stop is just 50 yards from the cottage. Tucked away in a quiet and very quaint lane, it is within easy walking distance of restaurants, shops, bars, golf course and of course the renowned beaches that this seaside town is famous for. The pretty harbour area is well worth a visit, with numerous small craft using its facilities. A boat trip is likely to produce a close encounter with the famous resident bottle nosed dolphins that are frequently spotted close to shore. There are numerous places of interest in the area, including Cawdor Castle, Culloden battlefield and a large nature reserve that runs along this superb coastline. Dog walkers are particularly fond of this part of the Highland coastline, with sea and forest walks in abundance. Inverness, the capital city of the Highlands is just 20 minutes’ drive away. You will find the nearest beach 200 yards from Sea Thistle Cottage in Nairn. With the shop 200 yards, and the pub & restaurant are 100 yards from Sea Thistle Cottage. Living/dining room: With electric coal-effect fire, 42 Freeview Smart TV with Netflix and DVD player. Kitchen: With electric oven, gas hob, fridge, freezer, dishwasher, washing machine and tumble dryer. Bedroom: With king-size bed, Freeview TV and dressing room. Gas central heating, gas, electricity, bed linen, towels and Wi-Fi included. Welcome pack. Small enclosed courtyard with sitting-out area and garden furniture. 2 small dogs welcome. Private parking for 2 cars. No smoking. Holidays at Sea Thistle Cottage run from Saturday to Saturday. Pets allowed at Sea Thistle Cottage. For a better idea of where Sea Thistle Cottage is, you can see Sea Thistle Cottage on the map below. Sea Thistle Cottage is in Morayshire; should you be on the lookout for a special offer, you can find all the special offers in Morayshire. It's always worth checking to see what is on offer at the moment. Do you want to holiday near Sea Thistle Cottage (UK5980), you can see other cottages within 25 miles of Sea Thistle Cottage; have a look to find your perfect holiday location.